do you know a sustainable star? Is your project, are you, or do you know a sustainable star in Pennine Lancashire? We are running a competition to discover the green heroes of the region and we are aiming to support every aspect of sustainability; from eco houses to schools, community project to construction. If you know of, or are involved in a sustainable project in the Pennine Lancashire region then we want to hear from you. There are 13 categories to choose from across a broad range of themes, and entry is completely free. It doesn’t matter if your project is up and running or if it is still in the conception and development stages – we are interested in promoting the sustainable practices and awareness of sustainability across Pennine Lancashire towns, whatever level of completion. 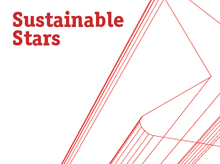 Check out the sustainable stars website and nominate or enter. a project that has used sustainable design methodology and planning in its inception, which demonstrates good design practice and has used the principles of the Elevate Design Handbook. This can include projects at design and concept stage, as well as completed projects. It also includes design related policy and guidance documents and best practice. a project that has involved the local community in sustainability; through employment, environmental objectives, planning, etc. a project that has included natural products like straw bale, lime render, cob, rammed earth, sheep wool, hemp and recycled paper insulation, etc. a project that has used renewable technology or a sustainable form of energy in its development. This category can also include research and development. a project that has used sustainable design in the renovation of a building, and / or it will be used to promote an environmental / sustainability programme. a project that has used specific heritage skills or approaches to building conservation in its renovation, conversion or construction. This category also includes projects and proposals that celebrate the social heritage of places. commercial or private dwellings built using sustainable methods of construction, adhering to the Code for Sustainable Homes criteria, BREEAM, Elevate KPI’s or equivalent. This can include any school / education new builds. a project that has increased the biodiversity of an area, either generally or through a targeted species. a business or project that promotes sustainable waste management and resource efficiency. This can include on-site waste management and stand alone recycling operations. an example of sustainability used within a business; i.e. local employment quota, sustainable procurement, staff training and education, innovative techniques, etc. a business that has been trading no earlier than Jan 2007; that is encouraging sustainable methods of supply, production and employment; that promotes sustainability in any explicit manner. a project promoting sustainability in any form within a school or college environment, including construction skills, technology research and training, modelling, etc. any project undertaken by a member of the public that has sustainability principles. This can include insulating a house, putting a green roof on a garden shed, creating a wildlife garden, building a eco-house, etc. This entry was posted in events, links, News, sustainability and tagged sustainable stars on July 29, 2008 by martin brown. What this means is that SCC will take a more integrated approach to its planning processes, putting peak oil, sustainable communities and climate change at the heart of its forward planning, which would/should/will include its construction and maintenance procurement and management. Is this the start of local authorities adopting a wider and longer term view of sustainability? It will be very interesting now to see the PQQ (preliminary qualification questionnaire) issues the county ask of its bidders, the selection criteria used in procurement and the performance indicators. One big impact should be the real focus on local labour, local materials and construction miles. At last we may have some real effort in addressing the impact we in the built environment have on the environment and climate change. Acknowledges the work done by communities in Somerset on Transition Towns and that the independence of the Transition Movement is key to its grass roots appeal. As demonstrated in its Climate Change Strategy, fully endorses the Transition Town Movement and subscribes to the principles and ethos of the organisation’s goals to reduce dependence on fuel oil and create more sustainable communities. Commits to providing support and assistance to all towns in Somerset that wish to join this initiative to help them achieve the goals they set for themselves as local communities, as demonstrated under the ‘Community Initiatives’ section of the Climate Change Strategy. Through the work outlined above, seeks to become the first Transition Authority in the UK. Agrees to undertake a review of its budgets and services to achieve a reduction in dependence on fuel oil and produce an energy descent action plan in line with the principles of the Transition Initiative. This entry was posted in built environment, comment, links, News, resilience, sustainability and tagged bidding, peak oil, PQQ, Somerset, sustainable communities, transition towns on July 29, 2008 by martin brown. 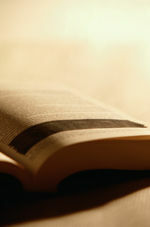 What are the top three books you’ve read on environmental issues that you would recommend? Why are they great reads,important or influential? Join the discussion underway on the Linkedin Sustainability Questions page and learn what others feel are important environmental books. I will summarise all the recommendations here soon. Not a member of Linkedin? contact me to get an invite. This entry was posted in links, literature, sustainability and tagged Linkedin on July 28, 2008 by martin brown. The latest issue of Grid Works has been issued and is available for download from here or from vendors on the Public Works area within Second Life. 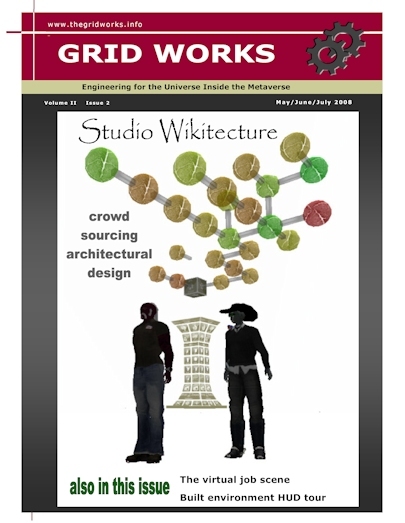 Once again CivilE Writer (editor) has pulled together an excellent journal that illustrates how second life and other virtual worlds can be used to improve the real world built environment. Grid Works is published quarterly for $L0 per year in Second Life. This entry was posted in built environment, collaborative working, comment, design, literature, second life, virtual worlds, web2.0 and tagged fillthathole, Fixmystreet, GridWorks, wikitecture on July 27, 2008 by martin brown. Around 10 or so years ago I was part of a BE (now constructing excellence) development group which produced the Be Excellent document and tool. The premise was to increase the awareness of constructions relationship within facilities management and excellence through collaboration by mean of a self, or facilitated assessment tool. Be Excellent is a simple but rigorous examination of business practice for all disciplines within the construction industry using the EFQM Business Excellence Model as the platform and take on board the important criteria for Collaborative Working, Supply Chain Management and the “design through to operational requirements” of Facilities Management. 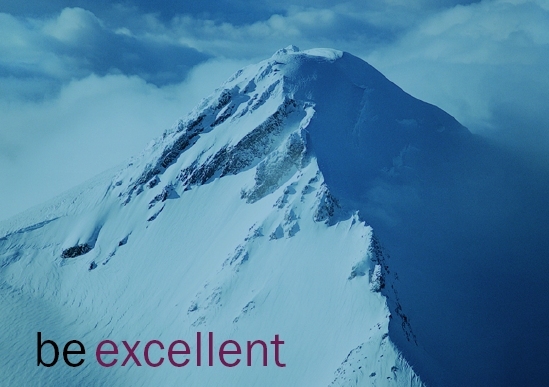 If answered honestly and thoroughly, Be Excellent will identify those areas which an organisation needs to concentrate on to improve performance. Whether the organisation decides to make these a priority is a question of where each sits within their overall strategic plan. During these last two weeks I have support a number of organisations with Be Excellent, so, with ‘excellence’ being on my mind, I share my thoughts here. I continue to use this approach as a first step analysis, helping groups or organisations understand where to put improvement energies and efforts. It works best as a consensus approach, with a number of assessments done across the width and depth of the organisation, providing an unique and revealing assessment of approaches, deployment and results. An assessment I refer to as a peoples view of the organisation, which is often at odds with a purely management view. And here is a main difference between this consensus approach and the top down ISO 9001 improvement or quality models. People want to be involved, or at least have a voice in shaping improvements, not to be forced into improvements via independent audit non conformance’s. EFQM ( European Framework for Quality Management) arose out of the 1980/90’s TQM (Total Quality Management) ideas. The UK construction sector at that time flirted with TQM but never really made the initiative ‘stick’, as it was just that an initiative with a shelf life, and not sustained. Indeed one of the factors that moved me away from employment with large contracting was the lack of ‘stickability’ on improvement, flitting across what was in vogue or required by any client at any one time. It was, and still remains, an add-on to business. How are you strategies, objectives and policies founded on customer intelligence and requirements, now and into the future? How do you manage, recruit and develop people in line with your vision and strategies, How does leadership act as a role model? Do processes really translate your vision, objectives and strategies into operations or are they there to satisfy some other ‘tick’ box? A programme was then put into place to review the lessons learnt process, to capture good learning points so they can be repeated, in addition to problems to avoid. we are good at approaches, new initiatives, new management systems, achieving ISO standards and other on the wall certificates. we are ok, but not so good at deployment, that is deployment of the approach is not sustained, either over time, or across an organisation, and often suffers at the whim of changing management. we are poor at learning, at analysing results for trends causes, and comparisons, and then on closing the loop to improve. Sadly, this reflects the view of Deming back in the 1950’s, that we do not close the Plan Do Check Act loop, even less so see this as a spiral, with the Act taking us to a better, more informed Plan position for the next project or time period. Be Excellent provides the peoples view to kick start and to sustain the improvement cycle. A copy of Be Excellent can be downloaded from here and you if would like to discuss this topic in more detail contact us here. This entry was posted in built environment, collaborative working, comment, EFQM, facilities management, improvement, knowledge, leadership, project management and tagged Be Excellent, Deming, EFQM, ISO, ISO 9001 2008, lean contruction, Plan Do Check Act, six sigma, Total Quality Management on July 25, 2008 by martin brown. ALL new homes built from 2013 onwards will have to be carbon neutral and emit no harmful greenhouse gases, the Irish Independent has learned. Solar panels, woodchip burners, wind turbines and triple-glazing windows will become standard features on new housing under ambitious plans outlined by Environment Minister John Gormley yesterday. Mr Gormley plans to change the building regulations so that “passive” housing becomes the Irish norm. Tougher regulations will also apply to office blocks and other developments. Swan Country Homes recently won a national competition with it’s design for a zero carbon Urban Village for Restormel Borough Council as part of the Urban Village Phase 2 in St Austell, Cornwall. Planning permission has been granted and construction is underway. The scheme which will encourage inclusive community living will provide affordable homes that have low environmental impact by minimising harmful carbon emissions. The development will comprise 19 units, 6 lifetime houses and 13 one and two bedroom apartments plus an area of community space. This entry was posted in housing, News and tagged eco homes on July 23, 2008 by martin brown.